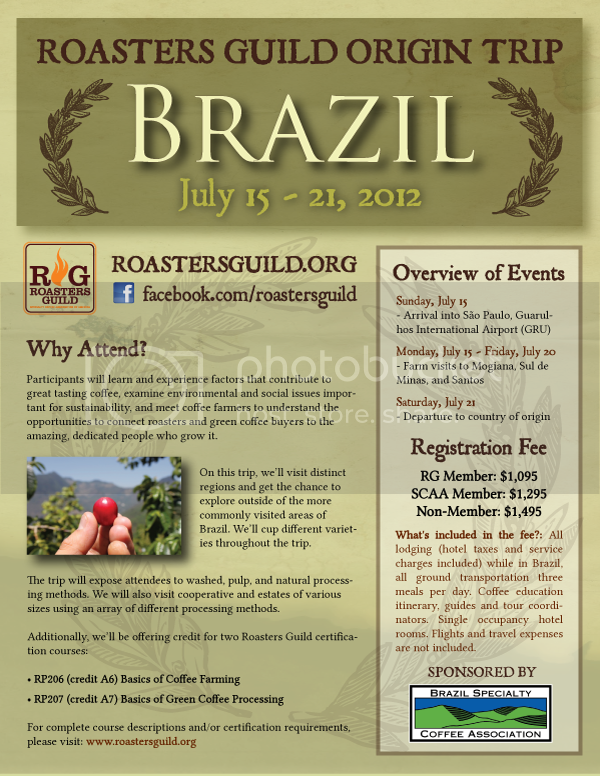 We are at work on putting together an RG Origin trip this July to Brazil. The goal is to have registration for this trip open by Expo giving everyone plenty of lead time. We've been working hard on making the process for setting up these trips as sound as possible with a keen eye on making sure we open registration for them well in advance of the trip. This is promisiing to be a really exciting one too! Any more info or updates about this trip? We will have dates ready to announce at Expo, as well as open registration. Dates are for mid-July. Register early, this one will fill up fast. Registration confirmation email is being sent with the subject, "Roasters Guild Origin Trip to Honduras 2011 - Registration Confirmation". Someone may want to update that. Thanks for the heads up Neal. Just updated it. I figure others may want the answer to this as well so I'll ask the question here. The registration confirmation shows the start of the event as 8AM on the 15th, the overview of events shows farm visits happening on the 15th, but with the following day of week (the 15th is shown as both a Sunday and a Monday). I understand that the time there is limited and there may be a lot to pack into that time, but my choice of flights is either for a direct flight which isn't scheduled to arrive until 9:45AM or flights that arrive earlier but have very long layovers. If I can avoid the 10+ hour layover I'd like to, but if things really are scheduled for 8AM I'll make arrangements appropriately. Please advise. Hey Neal - It should read Monday, July 16. Activities do not start until Monday, so the flight arriving on Sunday the 15th at 9:45am would work great. Apologies for the oversight! Thanks for the prompt clarification. Glad to hear I don't have to spend all day in an airport.